Being an FBI agent is a dangerous job at times; being an FBI agent working the Mafia in New York City is a life-threatening experience 24/7. Sometimes the danger involved comes from the most unexpected places, and in the case of retired FBI Supervisory Special Agent Lin DeVecchio, it came from his own organization. DeVecchio gets help telling his true story from Charles Brandt, a bestselling author and former homicide prosecutor. Together they weave a remarkable story of how one of the most successful organized crime investigators the FBI has ever seen was set up by lies, innuendo, jealousy, and ambition. It’s a complicated tale, sometimes a bit difficult to follow because there are so many players in this deadly game, but throughout the book the writers give us an insiders’ view of how one of the most revered institutions in law enforcement, the FBI, can be easily manipulated. Any cop worth his salt will tell you that if you’re working the street you’re going to get beefs. It’s a fact of life; it comes with the territory. Agents and cops who sit in front of a computer all day rarely come under internal scrutiny. But if you’re out rubbing elbows with crooks and creeps, people will complain about you. Most times the people complaining are the bad guys themselves who will do anything to get you off their case. They will lie, deny, and fabricate. The same principle holds true when working informants. By their very nature, most informants are scumbags. They have to be in order to know the players and where the action is. Yet they are the key to solving any complex crime. Without informants an agent is useless. In the world of organized crime, the Mafia in New York being the epicenter, many informants are also killers. To get them to “flip” or “rat” on a fellow member is rare, only a few FBI agents have ever been able to do that. DeVecchio is a master of informant development, so much so that he taught others how to do it. At one point in time, he had one quarter of all the top echelon informants in the entire Bureau. During his 33 years as an FBI agent, DeVecchio garnered 28 awards and commendations, and served as the supervisor of the Mafia Commission Case for then U.S. attorney, Rudy Giuliani. How did DeVecchio manage to get so tight with the mob and gain their trust? He did it by mingling with them, speaking their language, and being able to decipher such phrases as, “a piece of work,” which means a murder, “a wiseguy, a button, a good fellow,” all mean a made man. He could talk the talk; he was a native—an Italian. He blended in well in Mafia controlled neighborhoods like Brooklyn and Bensonhurst. With his people skills and analytical mind, he was the perfect fit to steer the ship the FBI set afloat in Mafia-infested waters. In fact, he was a driving force from the late 1970s–1990s in what is referred to as the “championship season” in the FBI’s war on the Mafia. So how did such an accomplished, revered, experienced agent find himself indicted for bribery and murder? Obviously the Mafia had a hand in framing DeVecchio—all rats flee a sinking ship trying to save themselves. But what’s surprising is how the Brooklyn District Attorney’s Office in New York was able to be led astray by an insubordinate lying agent who was driven by jealousy and the allure of fame. On a side note, the people prosecuting DeVecchio had secured an advance on a tell-all book concerning the case. One of the agents DeVecchio’s supervised, a green, naïve, ego-centric wannabe, began to keep book on his supervisor, DeVecchio. The problem was that the agent only got bits and pieces of what was going on between DeVecchio and his top echelon informant, often times listening from a distance while DeVecchio spoke with his informant on a confidential phone. Armed with a few scraps of out of context information, he surmised that DeVecchio was taking money and passing on sensitive law enforcement information to the mob. He even went so far as convincing a witness to testify that DeVecchio was complicit in several mob hits. This rogue agent somehow also convinced the prosecutor’s office that DeVecchio was dirty, and together, the agent and the government, in the person of Assistant District Attorney Michael Vecchione, set out to ruin DeVecchio’s career and life. Although he was cleared by a lengthy internal Bureau investigation, the government still indicted and arrested DeVecchio, and soon paraded him in front of the media, portraying him as a trusted public servant gone bad, ruining an extraordinary reputation built on results and strength of character. It took DeVecchio years to beat the charges that ruined him professionally and financially. Although some of his legal defense was donated, he still owes more than half a million dollars to his attorneys; however, what pains him the most after all the tumultuous years and hundreds of thousands of dollars spent to clear his name is that the FBI rewarded the agent who wrongfully accused him. Director Robert S. Mueller III, with no fanfare whatsoever, awarded the Bureau’s Ethics Award to this turncoat, and placed him as a supervisor in the Bureau’s Office of Integrity and Compliance. So egregious and outrageous was the granting of the award to an agent who violated his chain of command and was repeatedly insubordinate and disloyal, that the Society of Former Special Agents took the unprecedented step of lodging a complaint with Director Mueller. The honor was awarded despite the fact that Mueller’s own Office of Professional Responsibility cleared DeVecchio, and the DA’s office dropped all charges. 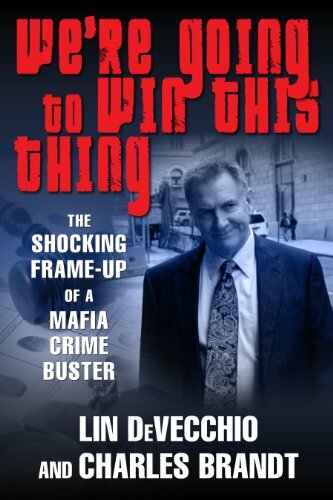 We’re Going to Win This Thing is a true story that has all of the elements of any television series or movie ever made about the Mafia: murder, mayhem, lies, corruption, greed, power, and character assassination; however, what trumps the fictional books and movies is that this is a true story . . . a sad one that chronicles the FBI’s failure to stand behind a man who stood up to the Mafia and helped bring the world’s most powerful and corrupt organized crime families to their knees. Don’t miss this book. It’s a jaw-dropping read.